Are you looking for a delicious vegetables recipe with a difference? If you are, you’ve found it! 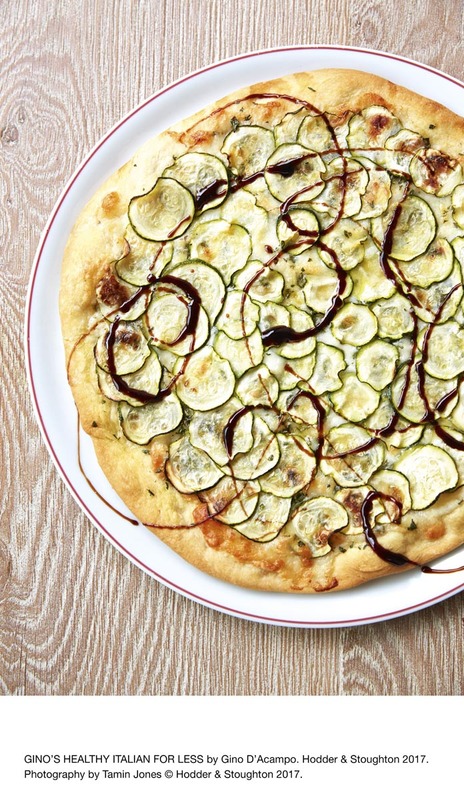 Here’s my pizza with courgettes & balsamic glaze for you to enjoy. 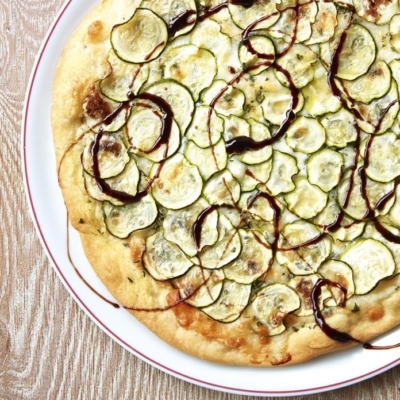 Feast your eyes on the finest pizza with courgettes & balsamic glaze! It’s straightforward and fun to make this great dish. Simply follow the instructions below and get the perfect result. Brush 2 medium baking trays with oil and set aside. Put the flour, yeast and a pinch of salt into a large bowl, make a well in the centre and pour in the water and extra virgin olive oil. Mix to create a wet dough (use the handle of a wooden spoon so you don’t get sticky fingers). Turn the dough onto a clean, well-floured surface and work it with your hands for about 5 minutes until smooth and elastic. Shape the dough into 2 balls and place in the centre of the oiled baking trays. Brush the tops of the dough balls with a little oil and cover with cling film. Leave at room temperature to rest for 30 minutes. Meanwhile, trim and discard the top and bottom of the courgette. With a sharp knife cut the courgette into really thin discs, or use a mandolin if you have one, as it will make this job much easier. Set aside while you preheat the oven to 210ºC/gas mark 7. Once rested and still in the baking trays, use your fingertips to push each dough ball out from the centre, creating two round discs about 22cm in diameter. Scatter the mozzarella evenly over the pizza bases and sprinkle the parsley on top. Lay the courgette discs over the mozzarella and parsley slightly overlapping, creating a circle effect. Sprinkle a pinch of salt and pepper over each pizza. Bake in the middle of the oven for 15 minutes, until golden and crispy. Drizzle over the balsamic glaze and serve immediately. 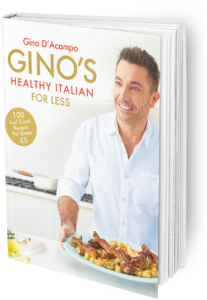 GINO’S TIP: For a really crispy pizza base, slide the pizza tin on top of a preheated baking tray in the oven. Once you’re done, simply sit back and enjoy your pizza with courgettes & balsamic glaze and don’t forget to check out other great authentic Italian recipes including great antipasti recipes, Italian pasta recipes, Italian soup recipes, Italian beef dishes and authentic pizza recipes.